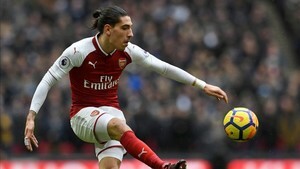 Hector Bellerin will move clubs next summer, most likely. The former FC Barcelona youth team player is having a shaky season at Arsenal. Despite that, big European sides want to sign him, with Arsenal planning to remodel post-Wenger. Everything indicates the Gunners need cash and Bellerin is one of their best options to sell to get it. The Catalan defender was wanted back by Barca last summer but they brought in Nelson Semedo. Juventus for a while have been tracking him. They haven’t been able to find a reliable right-back - not Lichtsteiner, not Cuadrado, not De Sciglio, not Howedes. Bellerin could help them improve at the back in a league which is very disciplined in that respect. Another club interested is Chelsea, regardless of what happens to Antonio Conte. Bellerin would fit their five-man defence on the right. Manchester United too could move for him. The price for Bellerin would be around 40 million euros.